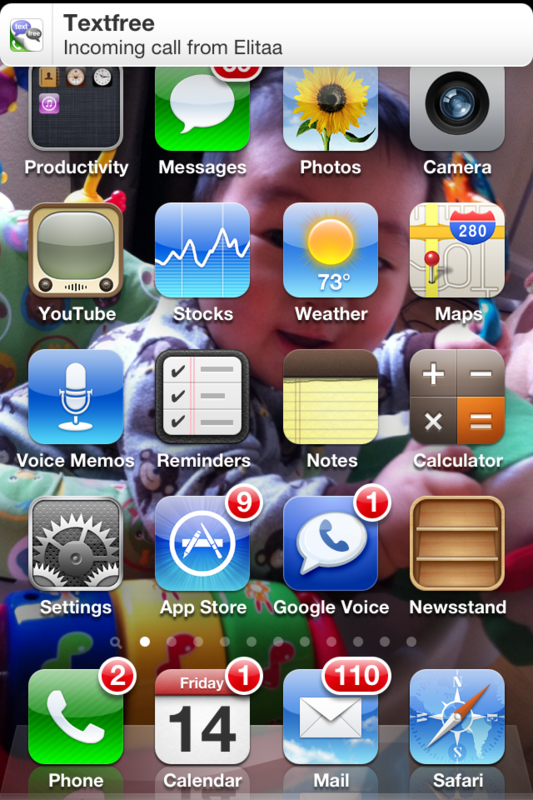 1) iOS 5 includes a new default setting that shows all notifications at the top of your screen, “banner” style. Ta daa! You’re all set. 2) iOS 5 also includes a handy new Notification Center that organizes all the notifications on your iOS device: new email, texts, friend requests and more, all in one place. Find Textfree, and use the 3 gray lines on the right as handles to pick up and drag the app to the top of the list! We hope these tips help make Textfree more fun. Happy texting, Pingsters! Don’t have Textfree yet? Visit the iTunes App Store, Android Market, and even text from your computer at Textfree Web. It’s all free! How do you get the iOS 5? once you plug your device into itunes usualy when you need to update sumthing pops up…and you have to have upgraded to itunes 10.5…hope i helped. How can you get it to alert me when I have an incoming call via textfree? I had someone text me back to one of my initial texts, but she received a notice saying the number was not available or something like that, and I never received her text. Any suggestions? thanks in advance for your reply/replies! Hm, sounds tricky! Please send your Textfree number and her number to support@pinger.com so our Team can help you sort things out. Lost the capability to copy/delete text and pictures when I updated my iPad 2 to iOS 5. Can you check this out for me pinger? Thanks! why dnt our emojis show still ? We should I text from textfree/voice because it’s free and you can text with all of yours friend! If you’re having trouble, email support@pinger.com for help from our team! This is handy knowledge, but I was wondering when are we going to be able to use the custom ringtones and alerts that are already on our devices? In iOS5 you can now set ringtones as text alerts as well on individual contacts. This is great for their new iMessage app, but not everyone I text has an iphone. If there was a way for our textfree app to use the ringtones/alerts that were already on our devices that would be awesome. I updated it on my ipod, but i can’t get the banner part? help pease. I updates to iOS5 and I have NO SOUND when I get a text alert or call. Smh NOT good!!! Here are instructions on how to turn on notifications. If it doesn’t help, email support@pinger.com to talk to our team. I don’t know how to answer these kinds of questions 😦 Please email support@pinger.com for help! R we ever gonna have an update for more ringtones and text tones? Why we can’t get pic from are friends when they send us pic ??? Sorry, but carriers are blocking this ability! You can still get messages from your friends by having them send to your username@textfree.us address. Why does Pinger keep calling my textfree number numerous times in a row?? Is anyone else experiencing this prob? Their office line (408) 271-5700 has called me 3 x in a row for the past few days, always a woman. That SO should not be happening 😦 Please email support@pinger.com and let them know your number, what the woman says, etc. We’d really appreciate your help in getting to the bottom of this! Why don’t I get any notification pop-ups when I get a txt. Sergio thanks this is very nice app? Ummm..im still kinda confused on how to get “Ios 5″…? How do i get ios 5???? Please answer my comment becaus eim real cofused! Thankss. Since upgrading to iOS 5, I can no longer make free calls to other textfree with voice users. Anyone else experiencing this problem? hao can i update my ipad to ios5 ??? Having problems with the app force closing everytime u try to open text free. I didn’t have this problem before I updated to IOS 5. Updated to the latest version whats the problem? I need help! How do I change my user name aka the picture texting address? How do I gett pictures fom other people?? I will like notifications to appear in text free app. I would love to update to 5 but ape has nothing on there I don’t know what else to do Im about to give up and just be stuck with 4 oh well I tried. He can log on to Textfree Web (http://pinger.com/textfree) from any Flash enabled computer to text you for free 🙂 Also, all incoming calls to Textfree are free! So your husband can call you any time on your app and you won’t receive any charges! how do i update to ios 5? awesome! its like a iphone now! yah! does it cost to update the iOS 5? if it does then i aint doin it. does it take a long time to do it or can i do it sittin here rite now at home? how do you update it? I have a problem: I already upgrade the iOS5 and I get the notification normaly.. I have downloaded the Textfree with voice but, when i do not have a wifi conection and then I re conect, the missed calls do not appear as “missed calls”, it doesn’t even appear!! :S and is really confusing because it pop out as missed call in notifications but when i open the application the missed call never appear, doesn’t appear how many, the time, anything!! Sorry about that! Looks like that’s a bug that we’re working on fixing. Go to our website! http://www.pinger.com/content/textfree/ You can download the app from the US iTunes app store or Android Market.